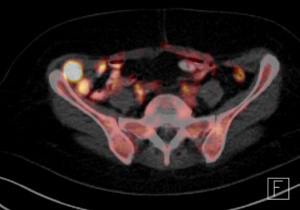 PET-CT is a combination of two examination procedures, namely positron emission tomography (PET) and computed tomography (CT). PET allows metabolic processes in the body to be visualised. In the process the patient is usually given an intravenous injection of a radioactive form of glucose, 18F-FDG (a so-called tracer). Most malignant tumours have a higher energy demand and consume greater amounts of sugar, so they can be visualised with a high degree of precision. The CT scan, performed almost simultaneously, aids the precise localisation and anatomical classification of the tumour. At present the PET-CT scan is the procedure with the highest level of diagnostic certainty in oncological medical imaging: in other words, it is able to detect tumours even in the early stages, tumours which might not be detected by other imaging technologies (e.g. 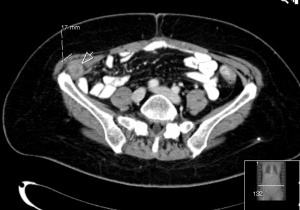 conventional CT or MRI). When should a PET-CT scan be performed? Can PET-CT scans be used for all types of cancer? In principle all tumours with a high sugar metabolism can be visualised with the help of the radioactive glucose 18F-FDG. This is true of most types of cancer (e.g. rectal carcinoma, breast cancer, pancreatic carcinoma, lung cancer, head and neck tumours, Hodgkin’s lymphoma). However, there are exceptions, among them prostate cancer, indolent lymphomas, brain tumours as well as neuroendocrine tumours. In such cases, nonetheless, it is usually possible to visualise these tumours using other metabolic pathways. In the case of prostate cancers, for example, a radioactive protein is used, which then binds to the cell surface of prostate tumour cells according to the lock and key principle (so-called PSMA PET-CT). Are the costs covered by health insurance providers? In Germany PET-CT scans are currently only covered by statutory health insurance in the case of small-cell and non-small-cell lung cancer, Hodgkin’s lyphoma and head and neck tumours. Private insurance usually covers the full costs. What must you be aware of before a 18F-FDG PET-CT scan? What happens during an 18F-FDG PET-CT scan? Before any PET-CT scan, a doctor will undertake a detailed discussion with you and answer any questions that you have. After the medical consultation, your blood sugar will be measured. When the scan is performed, there must be a distinct lack of sugar in the body of the patient, therefore a blood sugar threshold of 150mg/dL should not be exceeded. Subsequently, the radioactive sugar solution will then be injected into a vein. Following this approximately 60 minutes must be spent in a ‘relaxation room’ to allow the substance to spread throughout your body. It is essential that physical activity is avoided during this time, as this would allow the radioactive sugar to accumulate in the muscles, complicating the diagnosis. After this, the images will be taken by the PET-CT scanner. Scanning the entire body takes approximately 30-60 minutes. Should you have any questions regarding PET-CT before the scan, please book an individual consultation appointment with Dr Dr Vag or a member of his team.